Spike and Elden, members of the Empire. Empire is one of the four schools competing in the Island Open in Mario Tennis and Mario Tennis: Power Tour. Empire tends to be the typical favorite in the tournaments due to the presence of one very skilled player or doubles team. 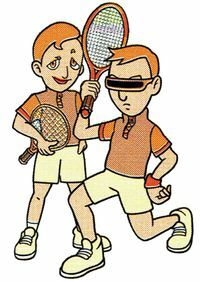 In both tournaments in both games, though, no one from Empire ever makes it to the final round, due to falling either to the player or the Costello Brothers. This page was last edited on April 30, 2017, at 17:30.